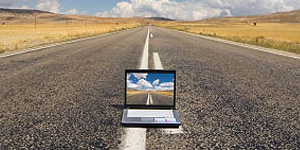 That’s a lot of work to rush through before hitting the road for your own or someone else’s mechanical mishap. Fortunately, a variety of receiver accessories can be trusted to get what is essentially a local job done. Some hitch-mounted for single-wheel use, others folding for complete lift, let’s look at two small, cheap and lightweight options one might consider as permanent furniture in the back of their four-wheeled hero. Quick preparations are required to trailer yours or someone else's stranded motorcycle. These pull-behind trailers get the (local) job done efficiently. There’s certainly convenience in calling on a handheld “trailer” that’s always available. Installed in seconds, it’s our first choice fallback where full haulers aren’t accessible or mileage is cross-town. Heck, even if you buy something else, one of these can still fit in the back of your LeCar. Anyone with more robust means of transportation, especially regarding horsepower and towing capacity, likely has a suspension to handle this next piece of kit. 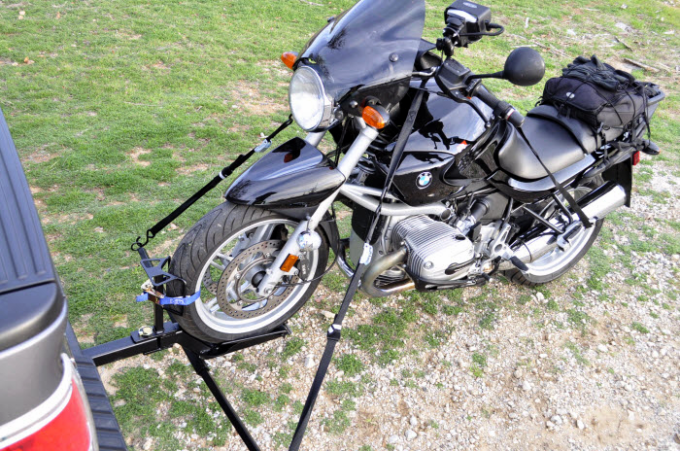 The equipment I’m referring to is that of hitch-mounted motorcycle carriers. Perhaps less grab-and-go ready compared to all things prior, it does one-up the front wheel chock in that the entire motorcycle gets a lift. The process is simple, really. 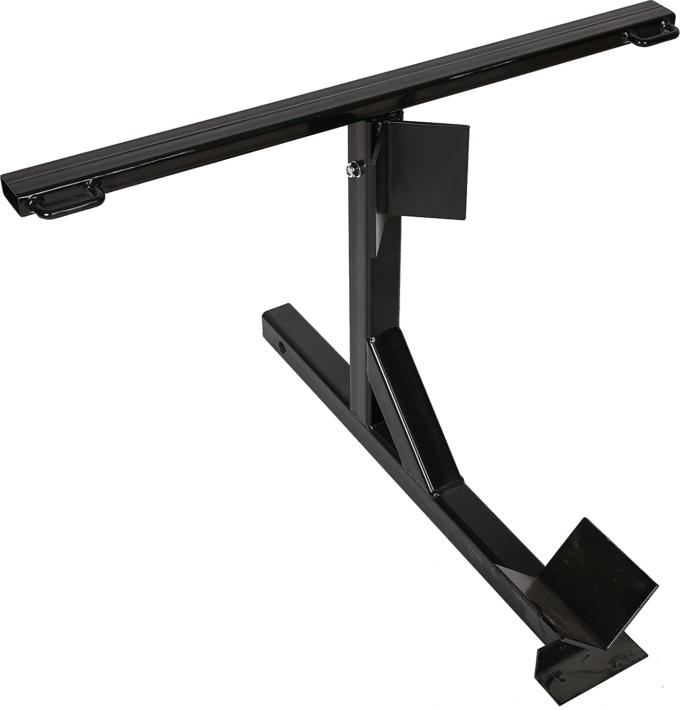 Like any other towing accessory, the platform plugs directly into the receiver before being secured with its respective locking pin. 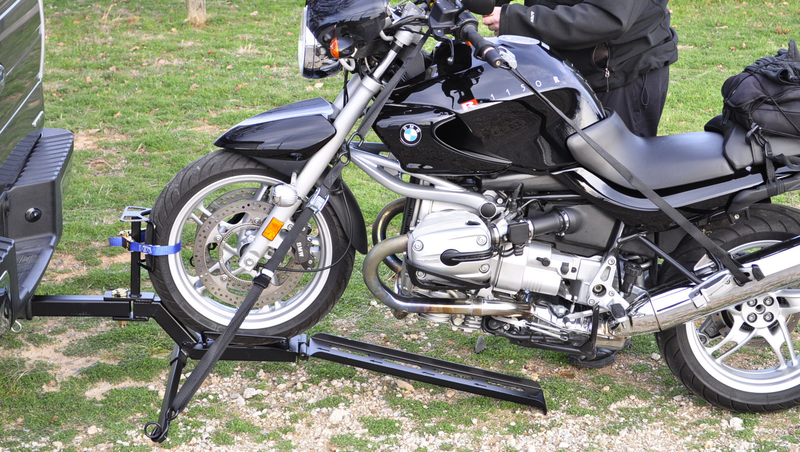 A ramp is then attached before the bike is wheeled into a pre-configured (adjustable) chock. Two pairs of eyelets await ratchet straps and once taut, you’re ready to roll. 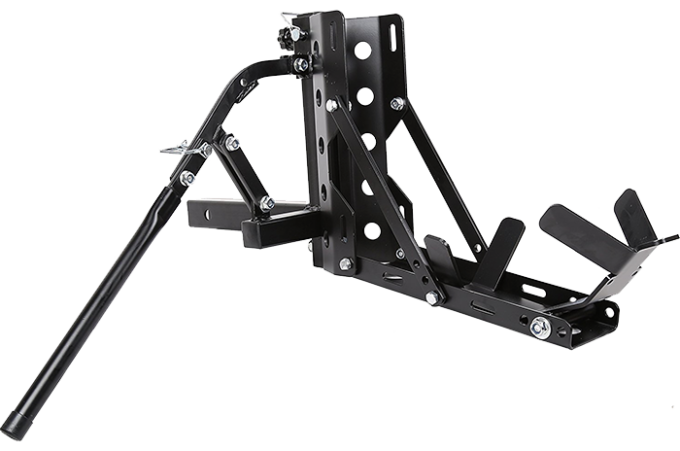 Offering significantly more maneuverability, quick release ramps and built-in securing points insure stable placement. Depending on the size of your motorcycle, a lighter chassis such as those typical to some dual-sport profiles means twin rails are often feasible (haul two bikes). If it’s capable of pulling even a small toy hauler, it’s a contender for these easy-access installs. My inspiration for this article arrived while reading Ted Simon’s Dreaming of Jupiter. On some muddy road in a far off land, his bike became disabled when an integral bolt failed before being lost in the muck. A truck driver agreed to tow him to the next town … by tying a rope to the bike while its owner rode it as if water skiing. Not that anyone should expect a driver to be carrying it with them but, thirty pounds of tin would’ve saved them both a lot of headache. All the better if the bike was completely suspended on the slightly pricier platform. Both are fast to rig and more than up to the task. So take your pick! Regardless of which bike towing gear is a better fit for your car, truck, SUV, van or bus, having it at the ready is a responsible first step. You never know when you, a friend (or nemesis) might need on-demand transport away from mother nature’s elements … or the bar. What Nearby/Local Motorcycle Towing Equipment Do You Recommend? There are a number of great trailers (and services) out there. Which ones do you prefer? What do you like about each and why? Your input is invited. Post an article! It needs a way to see the tail lights of the truck bike it’s mounted on though (lights mounted to ramp). I’m sure something like this would do.